If my previous builds are any indication, I am a big fan of Unimogs. So it was just a matter of time before I built another one. Rather than building one this time, I built a modular system that allows for a number of different versions. This build started with a desired to make another small build with the great Fischertechnik tires I acquired. 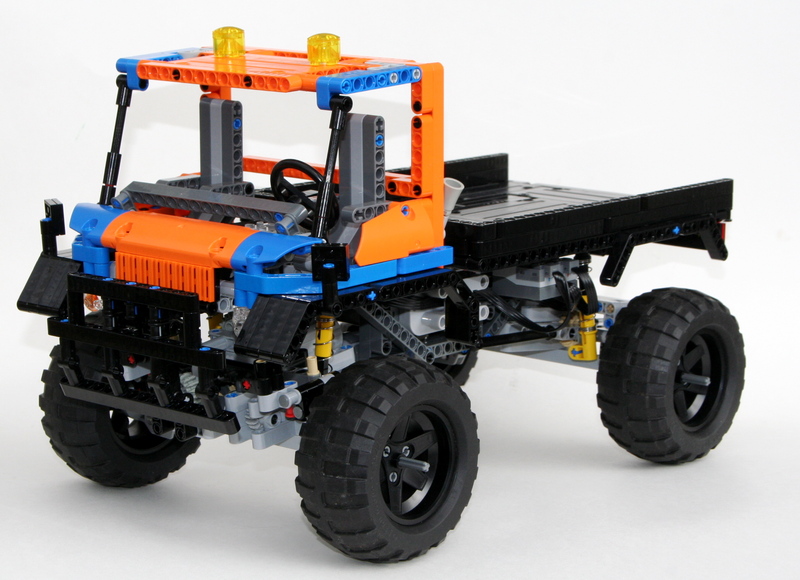 I wanted to build something small and playful like RM8s FJ or Sheepo’s Defender. As has been happening with many of my recent builds, I wanted to give the MOC some playable options and easy modifications. A Unimog was a perfect option, and who am I to turn down a Unimog? So I gave myself the following constraints: 4×4, I4 fake engine, steering, manual and PF drive options, removable cabs, removable bed, and two chassis. I set off to work. The axles came together fairly quickly. 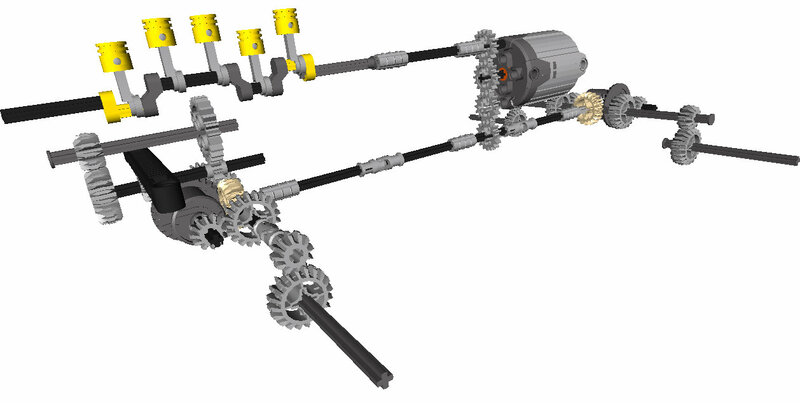 I decided quickly not to do portal axles, because I wanted the complexity of the MOC to be elsewhere. Both axles have a differential, two soft springs, and are stabilized longitudinally via steering links and laterally via panhard links. All for shocks are mounted on crankshaft parts to get the ride height of the Unimog just right. There is about 1.5 studs of travel for each wheel, which provides adequate articulation. 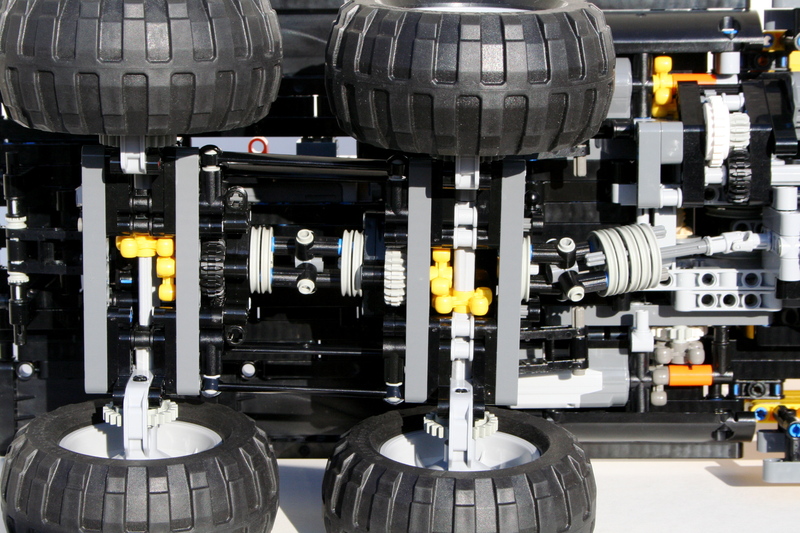 The axles are connected to a fixed axle that powers a I4 fake motor. Since I wanted the MOC to be easily switched between manual control and PF, the driveline got a little over-complicated quickly. The steering axle and drive axles cross each other twice. This allows for the steering to go to the top for a HOG, and backwards so a PF servo motor can be added. A 16t gear is available at the top of the chassis to power a PTO, or add a PF XL motor to give the Unimog propulsion. 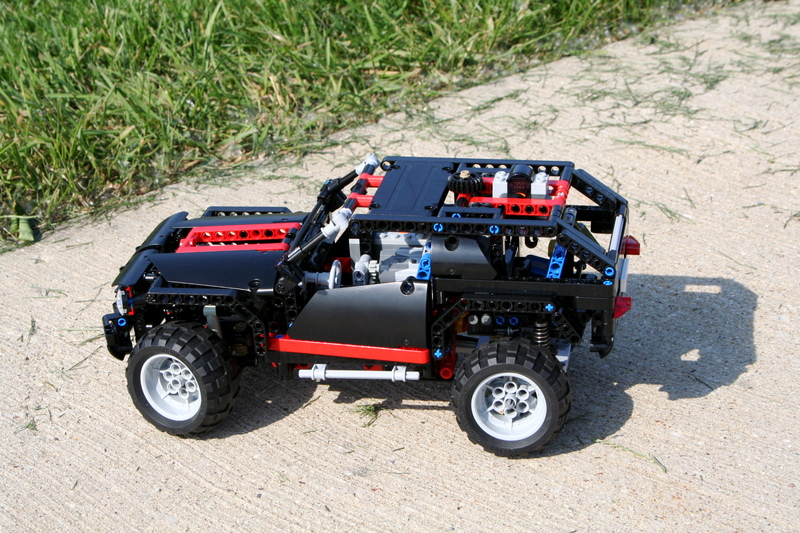 The long Chassis can fit a full a full Power Functions pack. When the power pack is not installed lots of open space is available for other additions. 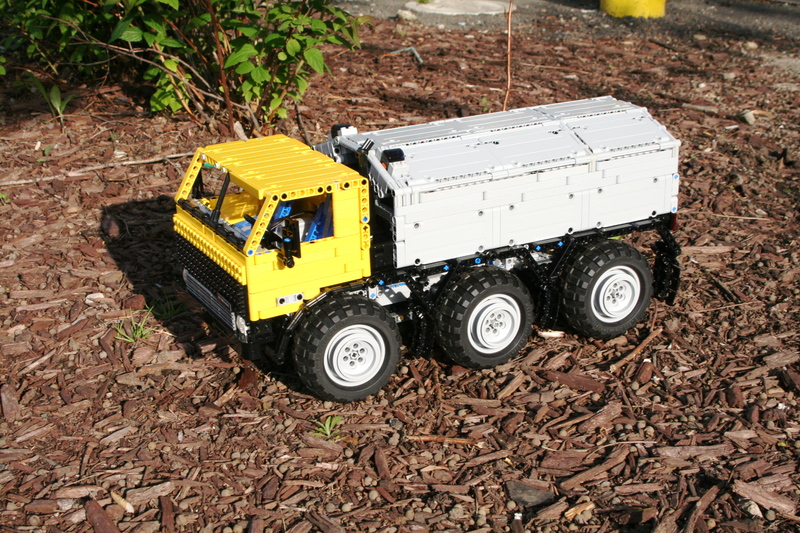 I added a three way tipper lift mechanism for both the long and short wheelbase chassis. Attachment points were added for the rear bed and for the cab. I created three cabs, and each can be added to both chassis (though the Doka looks best on the LWB). Two axles with stop can be pulled to free the cab. I created three beds and a power pack. Four axles with stop are required at each corner to secure the bed. A camper and a crane bed are not far behind on my building queue. The Unimog turned out exactly as I wanted. The suspension and steering are light and smooth under manual operation, and work great with PF. I am excited about the ability to offer and develop multiple beds and cabs. Instructions are posted, so I look forward to seeing other options people develop to make their own Unimog. Everyone once and a while I see a design I like so much, I copy it. So thanks to Horcik Designs on the fun little Fire Truck that I copied. Thanks for the inspiration. The full gallery may be found on Flickr and Brickshelf. When I found Horcik’s fun little Fire Truck, I was immediately enamored with the look of the truck. After deciding I was going to make it, I started looking for additional features to add to the excellent design. After finding some great ideas of a Renault version (2), I decided to get to work. The truck started with a 4×4 driveline and an I-4 engine. I used a simple live axle setup with 9l steering links to keep the sway movement in check, and both axles used a Panhard link. The steering was actuated with another 9l steering link, rather than the more common rack and pinion setup. This allowed for a lower engine mount, and something a little different in the design. The steering can be moved by both lights on the roof of the cab. Which brings us to the cab. I wanted to use the face of Horcik’s truck, but wanted to add some changes. I added two doors to make the cab a little longer, and added four of the new panel parts that work great as seats. Then I made sure the cab could be tilted simply, and connected the two roof lights to the steering. You can see the engine and the steering when the cab is tilted. Then off to the body. It turned out to be more simple than I had planned. I had some ideas for a hose reel, a roof mounted water gun, and various cabinets with tools inside. Every idea I tried was a little ugly, or boring. So, I closed up the design with a couple of water tanks inside the body of panels. It’s not fancy, but the design turned out clean, which is what attracted me to the project in the first place. The design worked fine, though the front axle could be a little more robust. It was not a complicated build, but it was a fun one. Don’t worry, there will be complicated builds coming soon. I confess. I took the bait, and started on the 2012 You Design It, We Build It before the final rules had been confirmed. I should know better. After all my schooling, you would think I have a good idea about how to follow directions. The first direction is, wait for directions. But, with all LEGO building, I enjoy what I am creating, and so even after the rules and directions have been given, I still want to contribute to the LEGO community. So, my next MOC is another Trial Truck, built with the intention of being easy to play with, easy to build, and tough enough to handle child play. All with instructions, so you can build one. I built this model based on what I thought could be improved on set 9398. 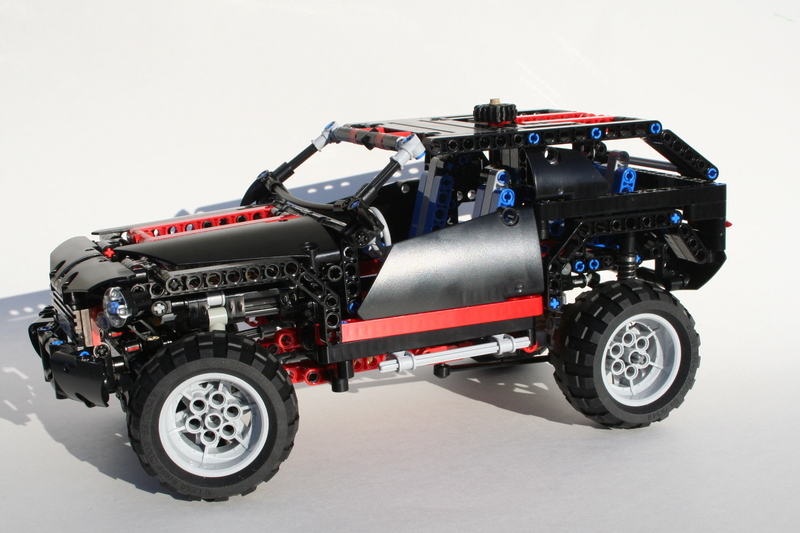 While this new set was a great step forward for the LEGO company, I felt there where a couple of changes that should be made to make the model a better off-roader. Because I was working with the assumption that this would be something LEGO would produce, I gave myself a couple of constraints. First, the model had to be less than, or equal to, the cost of 9398. Second, the model had to have improved off-roading skills. Third, the model had to have easy playablity, so the drivetrain had to be reliable, the battery should be easy removable, and it should be easy to drive. I started the frame before the axles. I placed the battery box directly over the driveshaft. An XL motor was place behind the BB and three 16z gears above the driveshaft. One 16z gear went up to the fake motor shaft. The driveshaft would connect front and rear to the two axles through the new ball joints from 8110. I then built the two axles, starting with the rear. To keep the speed of the Mack similar to the 9398, I would gear down the XL motor to about 1:4. The driveshaft came out of the ball joints and connected to the differential. I chose two 12z/20z gear sets as the final reduction. This would keep the driveline a little stronger, and help keep various axles from working their way out of the gears, much like the design of the 9398. The final gearing was 1:3.89. It’s not a stump puller, but it could still move up most hills. The front axle was a little more tricky. Basically, it had a similar setup, with a PF M motor placed on in it to work the steering. This was by design. To keep the driveline reliable, and limit the failure of steering, I kept the steering part of the axle, rather then having components placed in the chassis, and then connected via a shaft to the front axle. The steering is a little quick for my liking, but it works flawlessly. 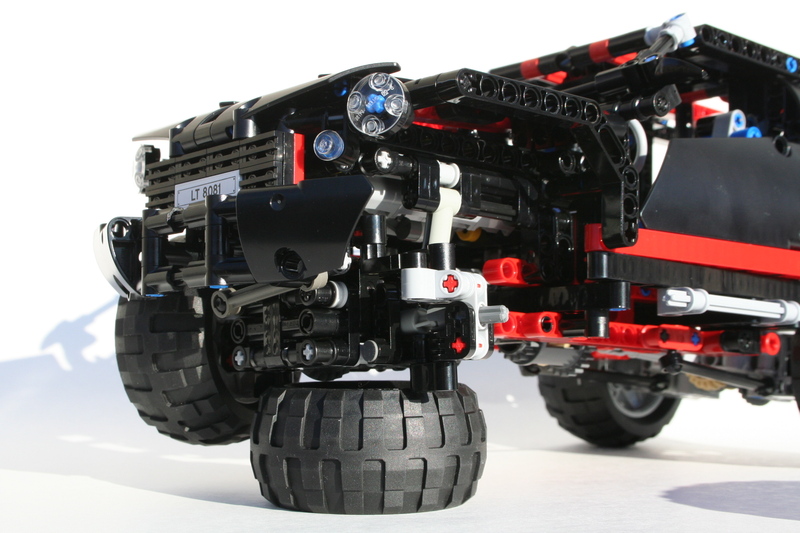 To understand more about the axles, check out the instructions. Through a little trial and error, I connected the suspension, and tweaked it so it would function in a way that was robust, and allow for great movement. I am still not pleased with how it turned out aesthetically but it functioned without problems, it supported the model well, and allowed for sufficient articulation, so I left it. I then added a simple body, a basic rear bed, and added some engine components such as exhaust, intake, and a simple turbocharger behind the fake motor. When I was done, I noticed the cab looked a little like an old Unimog. This seems to be a theme with me, as I love the look of the Unimog. On the other hand, I do not like the look of too many cabover truck designs, as such, many of my trucks have the slight setback cabover design that is very similar to the Unimog. My T55 is like this, and this is why I have built so many Unimogs. The model worked well. the suspension and stability was perfect. The truck was stable, and did not roll over, all while being able to handle various terrains. The gearing was sufficient and would be great for a playing child. It was easy to change out the 12z/20z gears in the portal axles to a 8z/24z setup which made the truck a little more strong. It would be a great model for many LEGO fans due to cost, reliability stability, and playability. So I have posted instructions for people to enjoy the model as well. I think it would have been a great LEGO set, then the rules were released. Next time I’ll wait for the rules. Thanks for reading. For some reason, I often find myself building two trial trucks at the same time. While I was building my ZIL 132, I also wanted to try something with floating axles. The model would use 6 wheels, a 3 speed transmission, and fully suspended live axles. I also wanted to model the Freightliner M2 Business Class truck as closely as I could. The model started as my trucks usually do; with the axles. The second and third axles would be identical, and would be connected with a simple pulley wheel universal joint between the two. 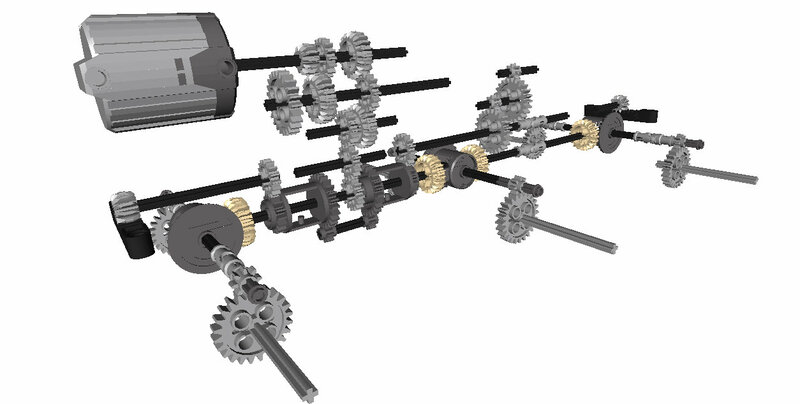 To keep the speed through the universal joints high, and the torque low, I used as 12z/20z gearing after the universal joints, then the knob wheels to rotate the axis, then the normal 8z/24z gearing on the portal axles to finalize the drive. This also allowed me to keep fewer knob wheels as the second axle had the drive shaft from the transmission pass uninterrupted to the rear wheels. The final drive ratio for the two rear axles were 1:5. The front axle was a little more work. I wanted to have the steering motor mounted on the axle so I would not need to have a steering shaft connect to the front axle. This proved too difficult, as it would raise the PF XL motor that I was going to use for the drive to high on the truck. I decided it would be better to mount the steering motor on the frame and connect to the front axle via a CV joint. Once I made this decision, the front axle became easier. I used a 1:3 gearing on the portal axles, a knob wheel, and then a drive shaft back to the transmission. The steering axle would exit just above the drive shaft on the axle to move to the right for the steering motor. The frame was pretty simple. Once I had the transmission placed, and the axles spaced, it was simple to place the suspension components, and the shock absorbers. Each axle had two steering links mounted vertically which connected to a 3×5 liftarm which would activate a shock absorber; very much like Lyyar’s design. Each axle had a steering arm to keep the axle from swaying laterally. Finally, all three axles had a number of 9L links to keep the various movements maintained. The transmission was going to be placed behind the PF XL motor which was under the hood. The changeover mechanissm would be placed in the center of the truck with the changeover motors mounted longitudinally, on both sides of the truck. The PF XL motor was place directly above the first axle, and was mounted on a moving frame that was moved by the changeover. This allowed a moving frame to work its way through the three gears. The ratios were 1.25:1, 1:1.25, and 1:2. This allowed for final ratios of 1:4, 1:6.25, and 1:10, which was more than capable for most terrain. The drive and steering Battery Box was mounted over the second and third axles, and the gearbox 8878 battery box was just behind the changeover in a little box on the bed of the truck. Finally, like always, a simple body was mounted. I had a little trouble getting the look I wanted on the front of the hood, as the suspension components kept getting in the way. I added a bed, covered the changeover and motors, and a couple more details and everything was finished. The model was not my best driving truck, as six axles do not want to always work together. The suspensions was supple, and I was getting no drive or steering input on the suspension. The truck worked well over various terrain, but struggled on some on step obstacles. The transmission mounting worked well at changing gears, but gears did not have a strong support, and I found they liked to skip at times. I liked how the suspension worked, but I do not think it brought enough of a valued to use this system again. It had moderate improvement on dealing with terrain, but it placed a lot of stress on a number of parts, such as the frame, the axles, the driveshafts, and the universal joints. The next truck will use a pendular set up again. 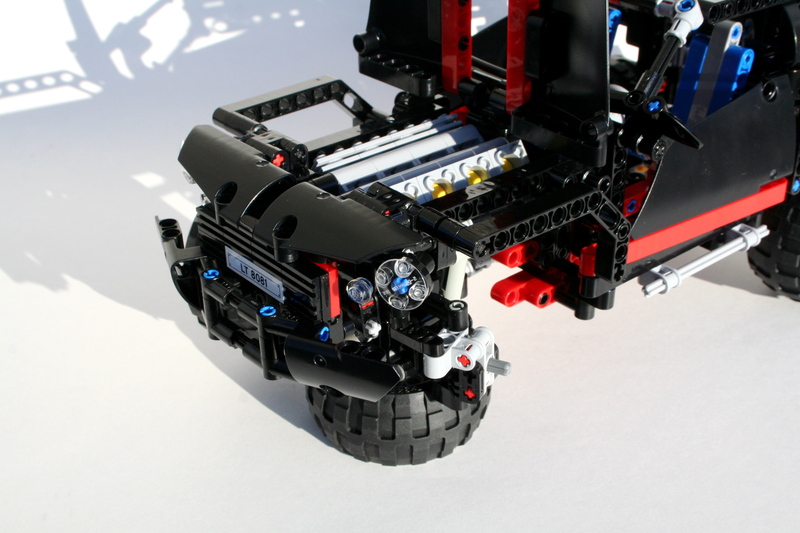 For most LEGO enthusists, when they purchased the set 8081, they quickly modified the set with a Power Functions drivetrain. It makes sense. 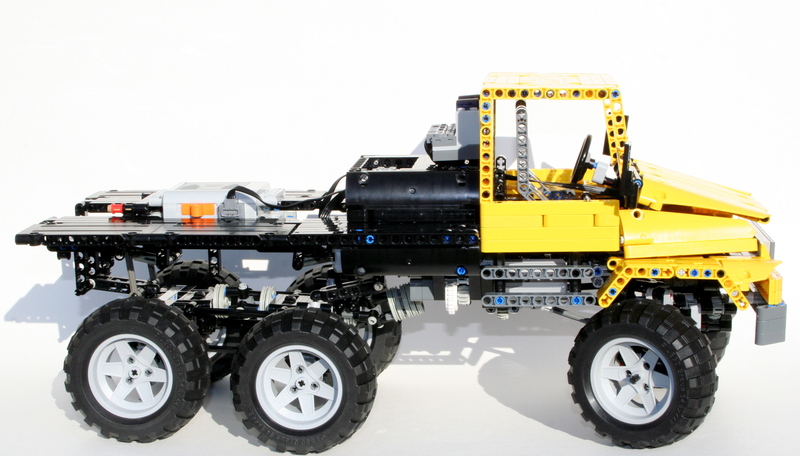 LEGO models are a little more exciting when they are motorized. But I guess I went a little backwards. I wanted to do the fun stuff first, and make the most complicated and compact drivetrain I could make. I posted the instructions here, and they can also be viewed on Rebrickable.com. But the comments kept coming from people who wanted to see my model motorized. So I thought it might be a fun addition. I added a two PF M motors, a 8878 Battary Box, and an IR receiver. I tried to keep the modifications simple, so I could easily add the motors to the MOD, and take the system out if I wanted to. The drive motor was placed on a simple mount that connected to the frame. The power was fed thought a 8z gear to a 24z gear which then connected directly to the V8 driveshaft. The driveline was unchanged from the V8 down. The steering motor was mounted laterally in front of the rear seats. A 20z double bevel gear drove a 16z gear, then a worm gear moved the final 8z gear which was mounted on the existing HOG steering axle. I removed the passanger seat which is where I placed the battary box, and created a simple mount for the IR receiver. The added weight required a new shock absorber, so I added that as well. The model worked alright. The drivetrain did well to handle the new power, and I could easily control the Crusier. The steering motor was a little too powerful for the upside down facing steering rack. It skipped a little under load, which was a problem over rougher terrain. The drive motor was a little taxed, so a PF XL would have done a little better. I guess I could add that, but I am ready to move on to my next model. Stay tuned. A couple of months ago I was struck by a new design by Waler. It was refreshing to see a well made Trial Truck based on something a little different. I wanted to make a model of my own. Thanks to him for the inspiration, and for the great ideas on the cab and the fenders. From the beginning I knew this truck was not going to be a serious off road contender, but I wanted to redesign the whole drivetrain. I decided to go with a pendular suspension for the first and second axle and a trailing live axle for the third axle. All three axles would have a differential and a a set of portal axles. The first and the third axle would also have steering linked together. As is often the case with my trucks, I had the pendular axles held by a turntable with the steering function passed through the turntable by use of a differential. The second axle was held by a turntable in the front, and the steering differential passed through to provide steering to the final axle. The drive function powered all three axles and would connect to the transmission and motor in between the first and second axle. 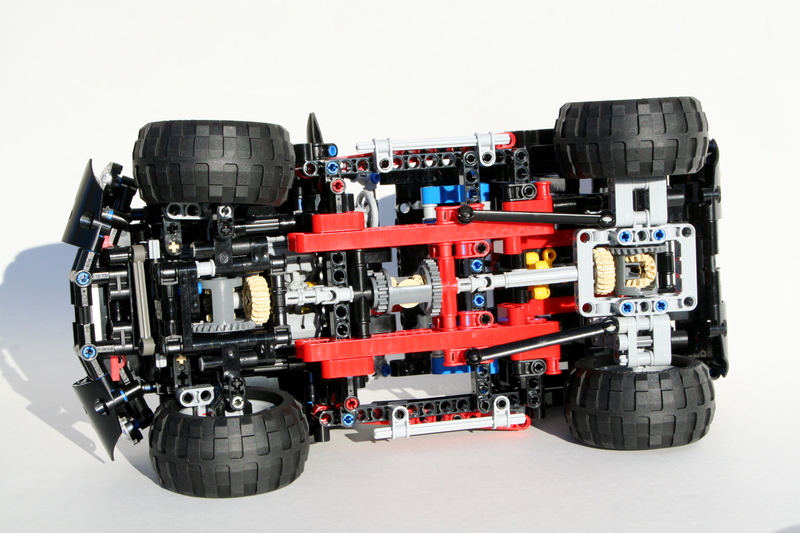 The third axle was a suspended live axle that had a trailing setup created with the new 8110 pieces. This would allow for rotational and vertical articulation while connecting the drive shaft and giving space to the steering function above. The steering shaft would allow for movement via a CV joint. The Power Functions M steering motor was placed in the rear, and used a simple 1:9 reduction. A Power Functions XL was used for the drive funtion and was placed between the front two seats. The motor was mounted on a sliding assembly for the gearbox function, much like the design pioneered by ATRX. I used my three speed changeover design to move the motor through three gears, for a final ration of 1:7.5, 1:4.7, and 1:3. The gearshift worked perfectly. While the drivetrain was a little complicated, the gearing was rather simple. The battery boxes were place above the second axle side by side. This kept the weight centered, and as low as I could get it. Finally I added a cabin and a cargo area. The cabin was straight from Waler’s design, as was much of the fender area. I used technic panels to create the cargo area, which also gave me a space to place the two IR receivers. This also hid the two battery boxes, and the wiring, and generally cleaned up the truck. I created two small doors in the top to assist with picking up the ZIL. I was done. Over mostly level ground the ZIL was one of my better designs. The differentials and steering worked flawlessly to make the ZIL drive easily. The gearbox worked well and eased the drivetrain over slight irregularities. But once the pavement turned to dirt the ZIL struggled a little more. It was not designed to have too much suspension travel, and this showed. It struggled on some of the bigger bumps, as the tires would scrape the wheel-wells. Overall, I was pleased with the design, and was happy with the way it turned out. It looked great, it was fun to build, and it was a blast to drive. The full gallery can be viewed here. 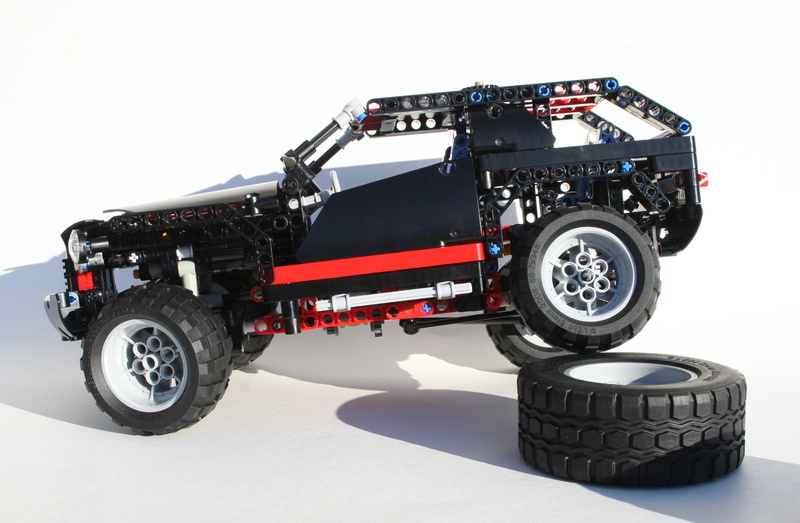 Also, a big thank you to The Lego Car Blog for posting this model on their blog. Truthfully, I was excited about set 8081 when it was first announced. I liked the size. I liked the coloring. I liked the stance. But mostly I liked the potential. Most of the Technic community dismissed the 8081 because of its watered down functions, but I was interested in making some changes to see if I could make the Cruiser Extreme. The full gallery can be found here, and instructions here. I first added a V-8. There was plenty of room, and after seeing a great modification from Efferman, I had some ideas. It was a simple addition. Next was the drivetrain. This was a little more complicated. I wanted to make it four wheel drive, and I wanted to make sure there were three differentials. I rebuilt the rear axle, so It would have a more active setup. I put in longer shocks, and added a Panhard rod, and two stabilizing links. It worked well. The front axle was more challenging. The new CV joints made the project a little easier. Once I had the differential place, I had to fit everything around it. The steering rack was placed upside down, and was connected directly to the existing steering link in the original 8081. Then I added a Panhard rod on the front of the axle, and rebuild the front bumper, and everything was set. Instructions can be found at Rebrickable.com or here. I also created a motorized version after a number of requests. You may see the gallery for that MOD here.